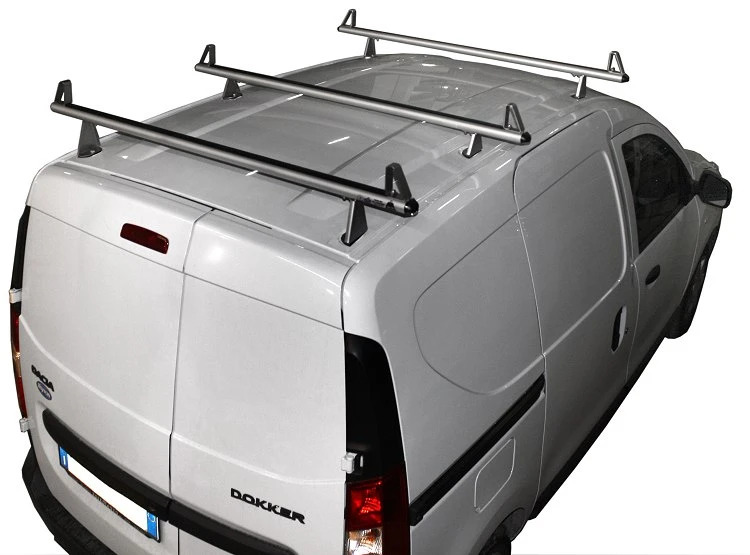 THE DOKKER: A NO-FRILLS VAN THAT IS MODERN AND PRACTICAL!! The Dokker from the automotive manufacturer Franco Rumena Dacia is small sized no-frills, but spacious and versatile van. Its strength lies its contained price, yet without having to give up anything. 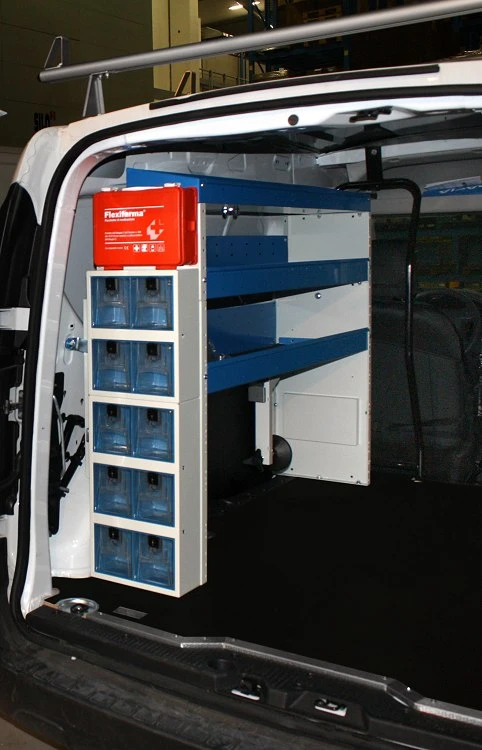 It is a mid-size van and the cargo space is voluminous enough for transporting goods or transforming it into a fully functional mobile workshop by installing a Syncro solution with racking components and accessories. The Dokker on this page has been transformed in order to maximize every available bit of space. 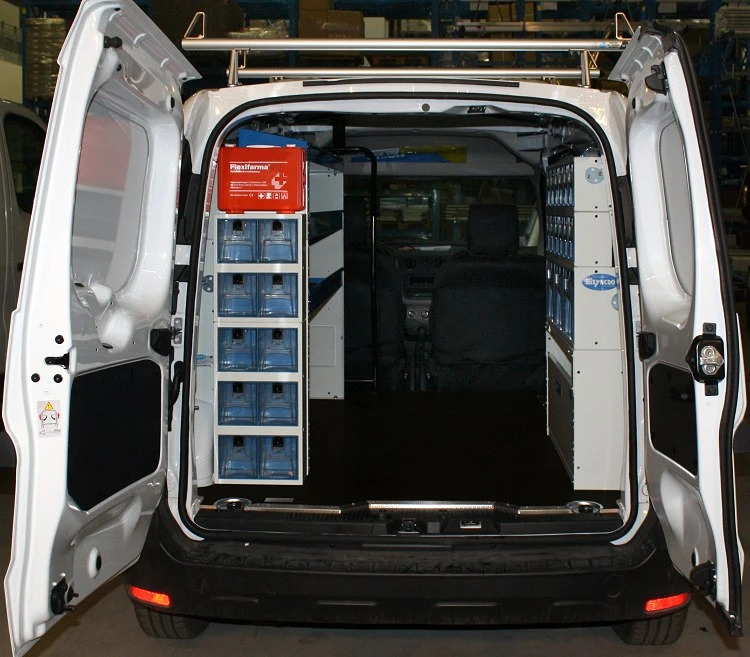 The owner can store tools and small parts and fixtures in the vertical shelving, keeping the cargo space relatively free to load boilers both inside the van, and thanks to the steel and aluminum roof bars, also on the roof. 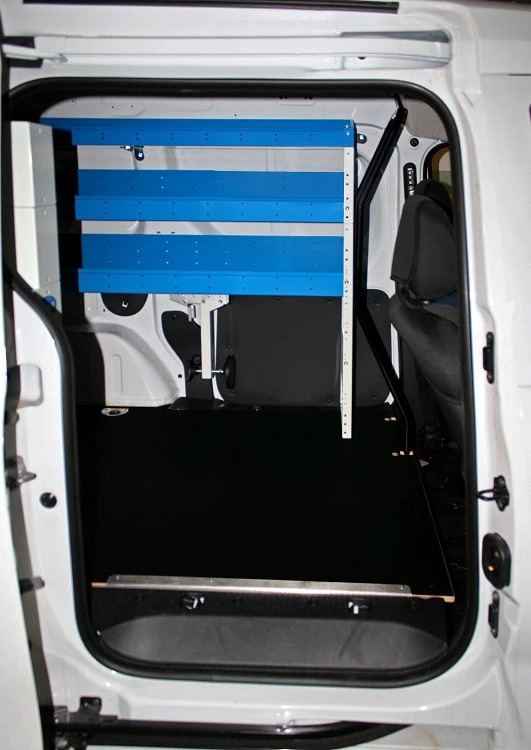 Like all vans, the Dokker comes with a floor poorly adapted to withstand the daily wear and tear of a working van. The Syncro catalog offers a wide range of interior protective panels and liners. On this Dokker, the Syncro team mounted a 12 mm, resin-coated, plywood floor panel with recessed anchorage points and reinforced anti-slip steel borders. The floor panel creates a perfectly level, extra-durable loading surface that is also ideal for mounting the racking components for phvac contractors. On the left-hand side, we see a shelving unit. 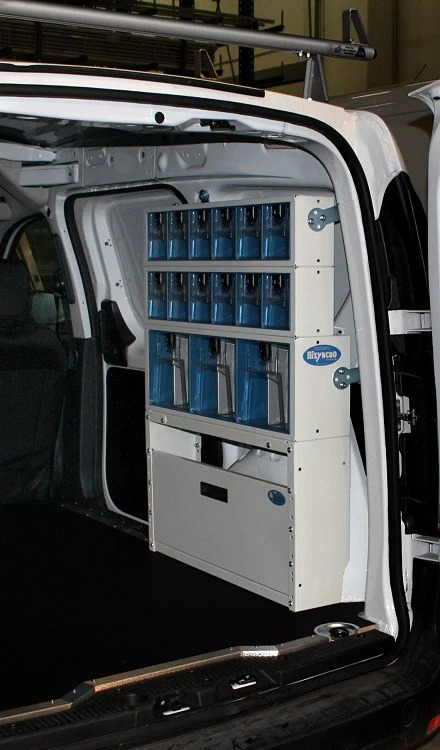 Along the bottom, is the safe case storage system - complete with automatic blocking system employing a shuttle that slides and locks automatically into place. The rest of the shelving unit consists of three shelves, all complete with aluminum dividers and rubber mats. Close to the back doors, we mounted two metal drawer units with forward-tilting, clear plastic drawers. The same drawer unit can also be found on the right-hand side because of its practicality of storing an enormous amount of small and medium parts and fittings. The PMMA transparent plastic makes finding what you need a breeze and they are extremely strong and stand the test of time. In addition, all drawers are fitted with individual automatic locking mechanisms and the unit has been designed without potruding parts. The right-hand side racking solution is straightforward: at the base, we placed a wheel arch frame with rotational hinge that allows wide-open access to the storage compartment. Above it, we mounted three metal drawer units with a total of 15 forward-tilting drawers in PMMA. The three larger drawers come with internal aluminum dividers. Due to the reduced width of the racking components -especially on the right-hand side- the loading area remains relatively free for loading and transporting even large cargo. On the top of the left-hand side drawer unit, we fixed a handy first-aid kit, in reach whenever you need it. To take advantage of the rooftop space, we mounted three aluminum cross bars with steel feet and triangular side stops. Thanks to the rubber uppers, both the bars themselves and the loaded cargo. 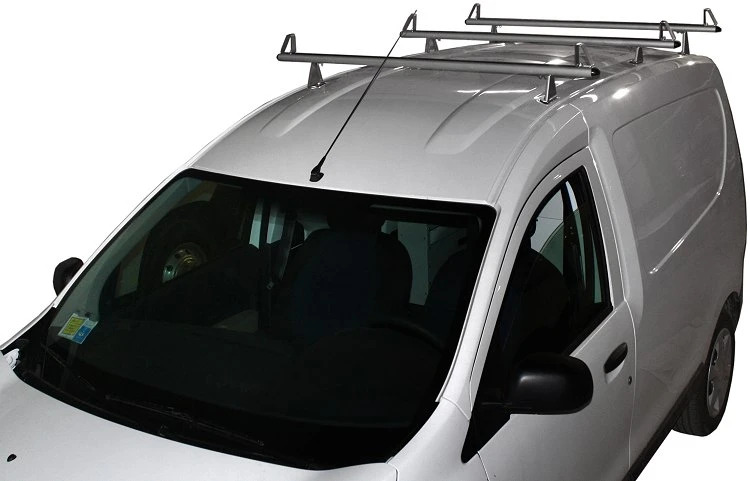 Vibrations and noise have been greatly reduced thanks to the improved aerodynamic design. With another conversion mission complete for the Syncro team – the small Dacia was transformed into the perfect mobile workshop for installing servicing hot water heaters.